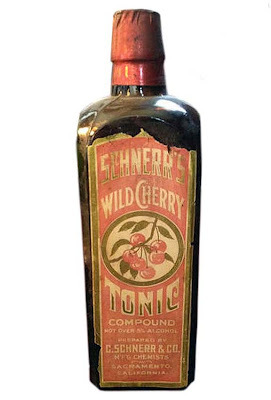 Just the other day a paper labeled bottle from Sacramento Schnerr’s Wild Cherry Tonic Compound Bitters on eBay closed for a whooping $2025.00. Just a ridiculous price for a post 1906 bottle with a paper label slapped on it. I remember a few years back one of the dealers here in the west bought a whole building full of paper labeled bottles from a closed drugstore. He must have had a couple of hundred paper labeled bottles that he brought to western shows for over a year until he finally wound up selling them one by one and eventually auctioning his whole table of bottles at the end of one of the shows at about $5.00 a bottle. I took a look at at the eBay site this morning, and low and behold, when I searched Sacramento in the antique bottle section up pops not one but three paper labeled bottles from Sacramento. All of the bottles listed are post the 1906 Pure Food and Drug Act. These three paper labeled bottles are so new they even have the company's phone numbers on the bottom of the label - Wonder if that makes them more valuable or desirable? And so, as with everything else, once something sells for a stupid price the flood gates open and items of a like kind seem to just fly out of the woodwork. If you are collecting post 1906 paper labeled bottles from Sacramento now is the time to get on over to eBay and open your wallet. Not "one of a kind". "Stupid is as stupid does", to paraphrase Tom Hanks' Forrest Gump character. A fool and his money are easily parted. Let The Flood Gates Open, contd.